I typically don't buy lulu unless I find something I absolutely love. That said, I tried on the Mountain Tank today in the Cadet Blue stripe and really love it! I couldn't resist getting it. It looks really cute paired casually with jeans. I usually wear 8 in support tops and 6 in non-support. Had to go with the 4 in this (as I did with the Open Your Heart LS), and it's still flowy and forgiving against my midsection. Also tried on the Post Sweat Pullover in a 6, and it was TIGHT. If you're on the fence, size up. I wasn't a fan of the hemline either (it's similar to that of the Base Runner 1/2 Zip, which I have but was my one reservation about the top). I did not buy it. the pace tights with the vintage pink are really cute. In the store they look great, good materials. I think the length is perfect for shorter ladies like me. I like the tinted canvas pattern. I have a scoop neck, hot yoga shorts and a cross my heart bra in that same print I always end up grabbing the bra for my workouts. Received the new speed short in black stripe with cadet blue waistband. Definitely, 2 -way stretch NOT 4-way stretch as indicated on website. Hey everyone, I just want to comment that I just got my order of cadet blue speed shorts, and these are most definitely 2-way stretch, NOT 4-way stretch as described online. It even says so on the tag. I'm sending mine back. Is that a new bag in the pic with the pink headband? LLA what size tinted canvas power y do you want? I have one that looks like that print and it's an 8. @ anon 1:09 pm - The cadet blue Mountain Tank is really speaking to me. I miss Vitasea tanks and wish LLL would have also re-released the Every Yogi tank along with the tee - and in prints! I've seen some try on photos of the Beachscape CRB and I know it would have made an awesome Every Yogi tank. The mountain tank is sooo unflattering on, unless you have a very straight thin body. Any curves and that thing adds the pounds. It would have been great amount 10 inches shorter and cut in a bid at the waist. Got my pkg today from the upload! Love the Wee stripe crops in pink, I didn't know if I would but they look adorable in person. 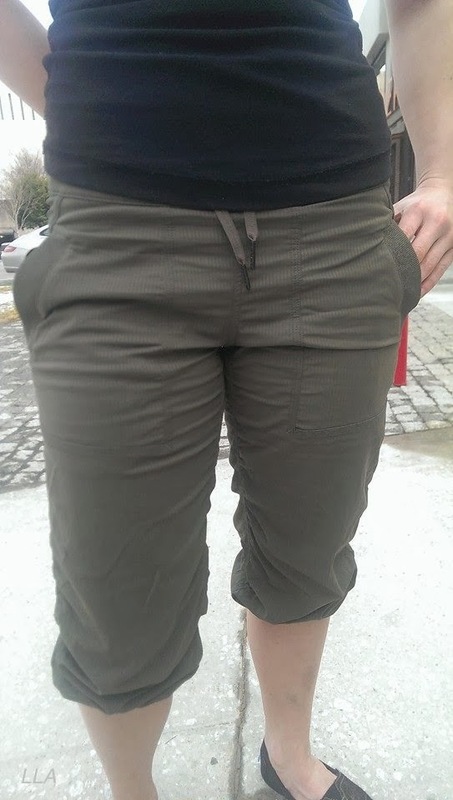 I ordered a size down and they fit perfect. I also received the Live Natural Crop, low cut in waist and feels like they may fall down so they're going to my daughter who is 20. The Live Natural are a true size fit and very thick cotton blend no sheerness. I love the back of the mountain tank but not the front low cut v shape. THat wouldn't work for me for yoga unless I had a really containing high bra. I also don't love it for that price for such a ho hum looking tank.